Perhaps what genuinely sets Linda Ronstadt apart from her musical peers in the early seventies – Jackson Browne, Joni Mitchell, Neil Young – was that she was a singer rather than a songwriter. In an era of the singer-songwriter, she plied her trade interpreting the music of others. That said, she had the good taste to draw upon some of the best songwriters of her day, including Dylan, Randy Newman, Jimmy Webb, Tim Buckley, Gene Clark, Jackson Browne, Anna McGarrigle, James Taylor, Emmy Lou Harris, Warren Zevon, and many others. Her memoir Simple Dreams is a brief affair, recounted in a series of short chapters that take the reader from childhood through to her decision of a couple of years back to retire from performing. While not mentioned in the book, it has become common knowledge that she was diagnosed with Parkinson’s disease late last year, which has left her unable to sing. In many ways, the core of her musical career can be traced to her childhood growing up in Tuscon, Arizona. Surrounded by desert landscapes and Mexican neighbours, Ronstadt states: “I don’t remember when there wasn’t music going on in our house”. She and her family listened to Spanish songs, cowboy music, Gilbert & Sullivan, Frank Sinatra, and old 78 recordings of Traviata and La Bohéme. Toward the end Simple Dreams, she responds to those who believe her career has been overly eclectic: “The only rule I imposed on myself, consciously or unconciously, was to not try singing something that I hadn’t heard in the family living room before the age of ten. If I hadn’t heard it by then, I couldn’t attempt it with even a shred of authenticity”. The primary motivation for her memoir, as stressed in the book’s sub-title, is to track her musical career, which began in her late teens. By the time she’d reached age 20, she was living in Ocean Park, LA, and playing with the Stone Poneys, at a time when bands like the Byrds were ushering in a new era of country and folk music. Hanging out at the Troubadour, she soon came to the attention of Herb Cohen, who negotiated her a record deal with Capitol, minus the band. Though she had a few early successes, with songs like ‘Different Drum’, there were many rocky patches still to come before fame caught up with her. Her growing circle of friends in these years included many musicians involved, or later involved, with bands such as the Nitty Gritty Dirt Band, the Flying Burrito Brothers, and the Eagles, along with young songwriters like Jackson Browne and Warren Zevon. She was with Gram Parsons in a house in the Hollywood Hills when Keith Richards played a new song ‘Wild Horses’: “Gram was salivating over this song and begged Keith to let him record it before the Rolling Stones did… I wanted the song too but I knew I wasn’t going to have it”. Ronstadt came into her own in the seventies. She signed with Geffen’s Asylum label, home to a new generation of singer-songwriters, around the same time that she released her final Capitol album Heart Like the Wheel, which delivered her a spate of hits. She later got together with Emmy Lou Harris and Dolly Parton for the first of several trio albums. 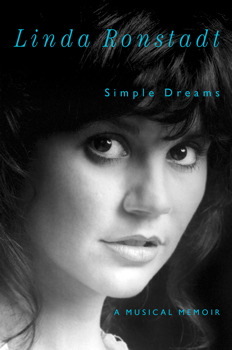 By the 1980s, Ronstadt had become restless with the endless touring and rounds of recording. In a decade that proved hard on many seventies artists, she set about transforming herself, firstly as a Broadway singer in the cast of Pirates of Penzance, and later in Bohéme, though she openly confesses she was woefully out of her vocal depth with the opera, which proved a financial disaster. Going against her record company’s wishes, she subsequently made recordings of the great American songbook, with arranger Nelson Riddle; an album of traditional Mexican songs, Canciones de Mi Padre, with arrangements by Rubén Fuentes; and collaborated with Aaron Neville. Her instincts proved correct, and these albums continued her run of Grammys and platinum-selling albums. Ronstadt’s private life remains a closed door throughout most of her memoir, and it’s clear that her personal relationships are a no-go area. While she briefly alludes to her relationship with then California Governor Jerry Brown, other references to the men in her life seem veiled in mystery. I was taken aback, late in the book, to come across a reference to two grown-up children, though a brief trawl of the web soon cleared that up. Perhaps, more frustratingly, her many illustrious friends and musical peers often receive no more than brief walk-on parts in the book. Ronstadt tends to speak well of almost everyone, though there are occasional regrets, such as her falling out with Jerry Wexler over his production duties on the American songbook recordings. Her kindest words are perhaps saved for long-time musical partner Peter Asher. All in all, it’s a rosy re-telling, one that harbors little bitterness or chagrin. Then again, with a career that has garnered 10 Grammy awards (or 11, depending on who’s counting), and a further 17 nominations, Ronstadt has clearly earned the right to look back positively on her life. Next Article Keith Richards Turns 70!